Speedex Mineral is a daily supplement to ensure the horse receives enough essential mineral nutrients. It supplies calcium, phosphorus, magnesium and vitamins to the horse. 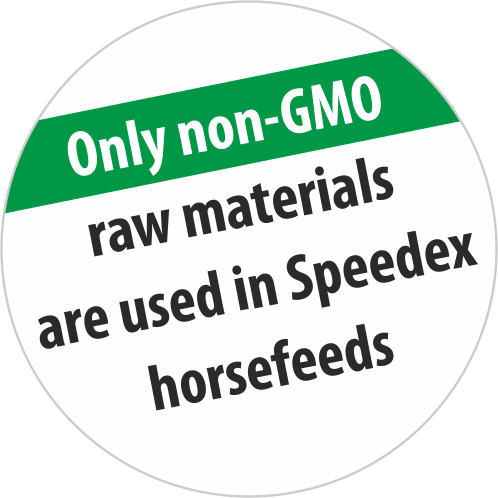 The trace elements in Speedex Mineral are BIOPLEX®-chelates that supply the horse with trace elements in a form as close to nature as possible. sugar beet pulp, calcium carbonate, grass meal, oat bran, wheat bran, magnesium phosphate, monocalcium phosphate, salt, premix, vegetable oil, liquid molasses, magnesium ocide, BIO-MOS®, BIOPLEX®, SEL-PLEX®.